Long Beach Unified School District Deputy Superintendent of Schools Jill Baker earned the Secondary Education Award from the Long Beach Branch NAACP last week. She accepted the honor at the NAACP’s 38th Founders’ Gala Celebration Dinner at the Long Beach Hilton. Baker was recognized for her work to support the NAACP’s work on issues of social justice, equity and civil rights. 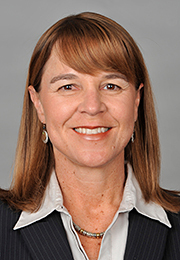 Baker began her career in LBUSD as a teacher, then served as principal, Leadership Development Office administrator, assistant superintendent and chief academic officer. In 2005, she completed her tenure as a fellow in the Broad Urban Superintendents Academy. She earned her doctorate in educational leadership at USC, master’s degree in school administration at Cal State Long Beach and bachelor’s degree in sociology at UC Irvine. In 2010, the NAACP also honored Baker with an Outstanding Women Award. Baker’s daily work in the school district is focused on building an entire system of high performing schools, whose staff learn and improve through interaction with the district and engagement with one another. This work includes strategic leadership and partnership with the Office of Curriculum, Instruction and Professional Development on the district’s K-12 implementation of the California Standards, and the development of organizational systems to support these efforts. Her departmental oversight includes working with the school district’s Early Learning and Pre-school Division leaders, the Leadership Development Office and supervision and support of the district’s schools. Also honored at the NAACP event was Mike Murray, a long-time supporter of the school district and current president of the Long Beach Education Foundation. He earned a Lifetime Achievement Award.